I’m going to write this as fast as I can so I can say that I finally finished a blog post this week. It’s raining here so I have a little reprieve from cucumber picking. 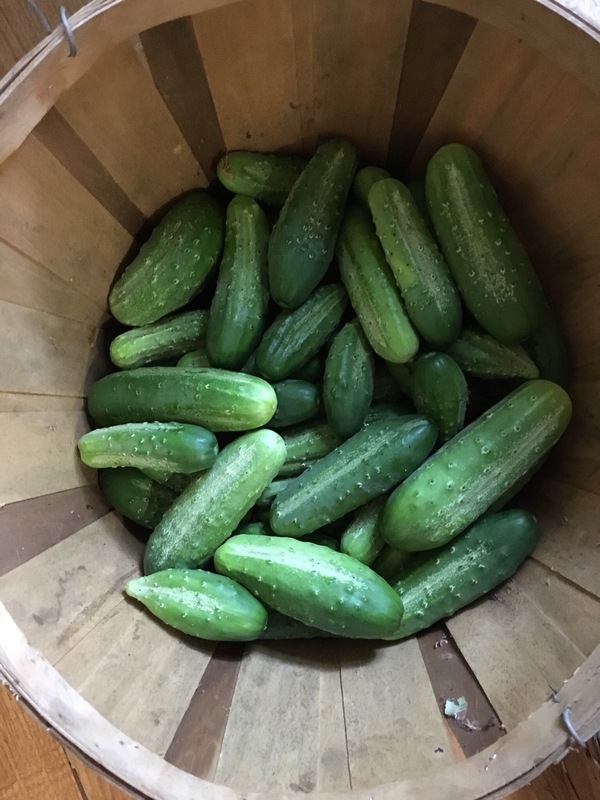 We have had a super abundance of cucumbers that I have been pickling as fast as I can. Sweet pickles, dill pickles, refrigerator pickles, bread and butter pickles. We have eaten cucumber sandwiches at least once a day for a month. I have given away cucumbers by the bag full. I am beginning to consider leaving them in my mail box for our mail lady and making anonymous cucumber drops at every church and doorstep in the surrounding area. Currently there are three bushels in my laundry room! Thank goodness D. ends his extra work hours this week because now the tomatoes are coming in (all 84 plants!). Pickling ends this week and tomato canning starts next week! I’m already running out of storage for all this so at some point I have to stop the canning to shuffle stuff around for more room. I’m seriously wondering if the canned food would be safe in our storage unit over the winter. In other news, we have been spending a ridiculous amount of time securing animals. We had to get creative and tie feed bags along the perimeter of the new chickens’ run because they were so small they could get out through the fencing. We have redneck ingenuity down to a fine art around here. It’s not pretty, but it’s cheap and effective. Hopefully it won’t be there too long. 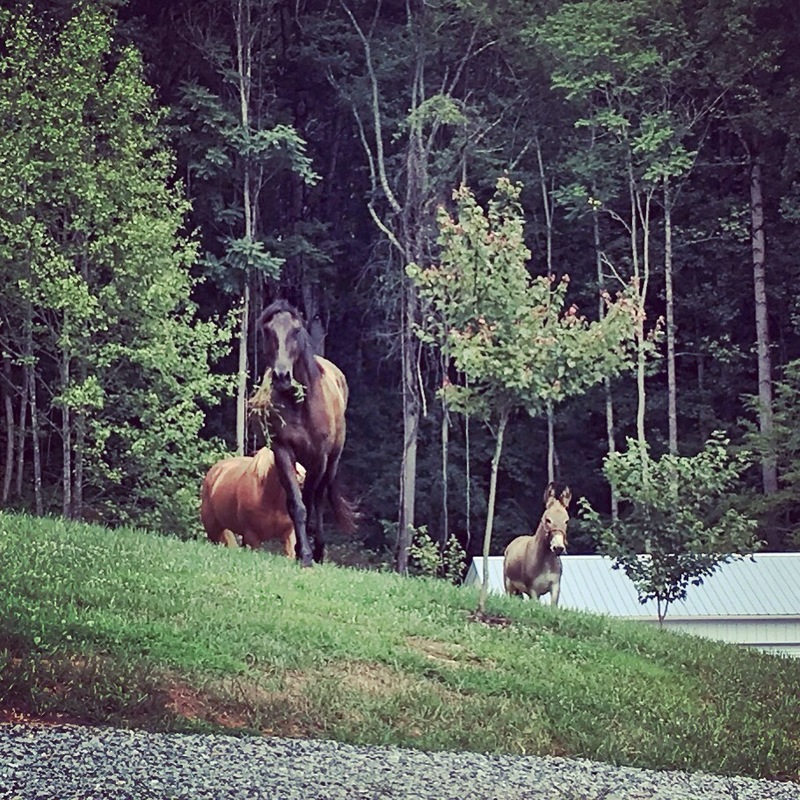 Big Bad Bob kept escaping from the pasture and taking our donkey and the trainee horse with him. We couldn’t find where they were getting out so we spent the past weekend, including our Sunday, walking the fence line, moving fence post and running more wire. Well, D. did most of it. We also made the hard decision (though not nearly as hard as before all the escapes) to sell Bob. He was seriously upping his mischief level lately and we were worried about the safety of the other horses and well as mine and Miss L.’s. 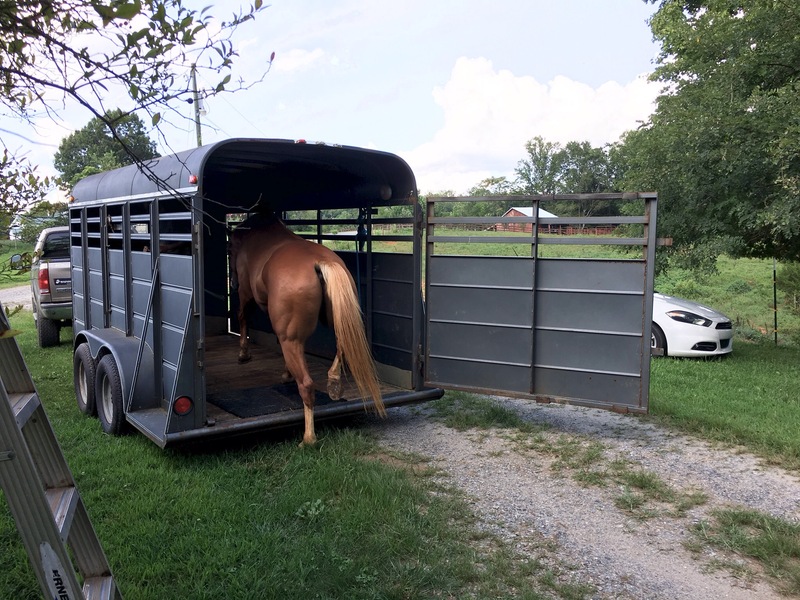 He’s a big ‘ole horse and sometimes was not patient about waiting for us to open his stall door. I was envisioning myself as a greasy spot after Bob plowed over me on his way to catch up with his buddies. 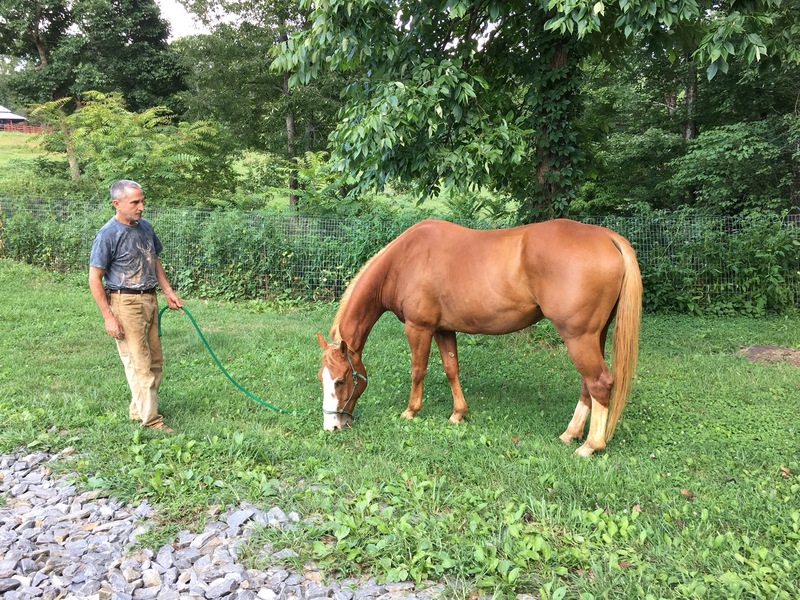 We miss his handsome goofy self, but he is with a co-worker of D.’s who also trains horses and is in good hands. No real artwork happening at all. The kitchen table (aka my studio) is currently covered with dehydrators. Oh yeah, we are making cucumber chips too and my herbs are coming in as well, so I’m drying them. I have a sweater on the knitting needles but it’s a pretty boring pattern. 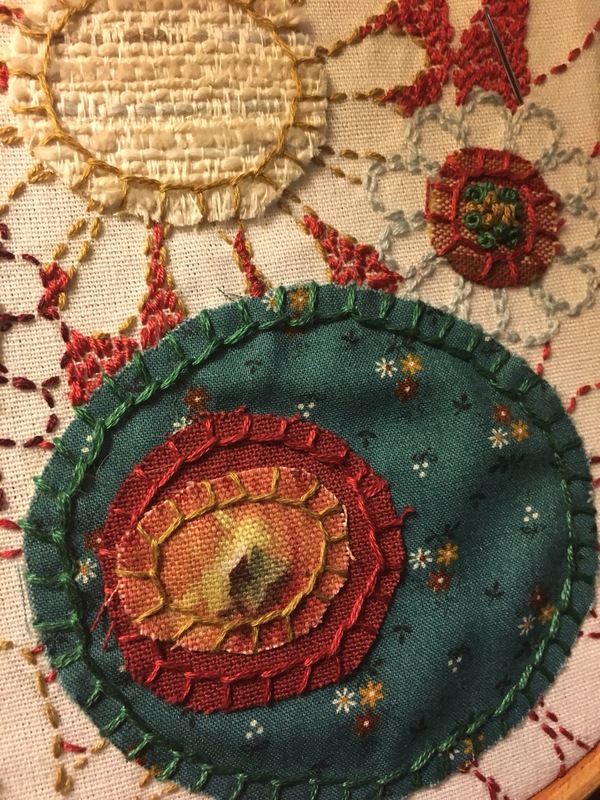 I did start some embroidery/textile art because I HAD to do somethings creative. I get cranky when I don’t have somethings artsy to do. This is small and easily tucked away but also easy for me to pick up and put down in my spare few minutes. The only other thing I want to mention this week is for those of you who read this crazy blog to keep up with Miss L. She has been with us for over a year now and is doing very well. She is in pre-teen mode and if you have survived that stage yourself or that of your kids, you know that it’s, uh, challenging at times. I have decided that it is time to limit what I put out on social media about her life now. She will soon be of age to decide how much she wants to share on her own and it’s not my place to tell about her life. If we do something as a family she will be mentioned, but otherwise I will be keeping her life private. If you are a member of the community that helped look after her, you are welcome to message me for an update. I just feel it’s best to protect her privacy. Next week my daughter and son-in-law will be in for a visit. I seriously doubt I will be able to work in a post. Bear with me. I should be back on schedule once school starts! Go eat a pickle and have a great week! Yes, I am two weeks behind here. Yes, I have tried several times to get a post written but my time has been limited. Very limited! Week before last I took the week off while Miss L. was away on a mission trip with our church so I could get a good start painting my kitchen and some other very involved stuff. Things do not happen here in grand and glorious sweeps. Our accomplishments come in tiny bits and pieces squeezed out of odd moments of time. Last week, well, the high summer season kicked in and Mother Nature rules. I am going to give you bullet points and photos because I just don’t have the time at the moment for long thoughtful writing. Hopefully I can squeeze some in between now and September, but don’t be surprised if there are more posts like this over the next month. My apologies. Life happens. The 25 cucumber plants are producing PROFUSELY! 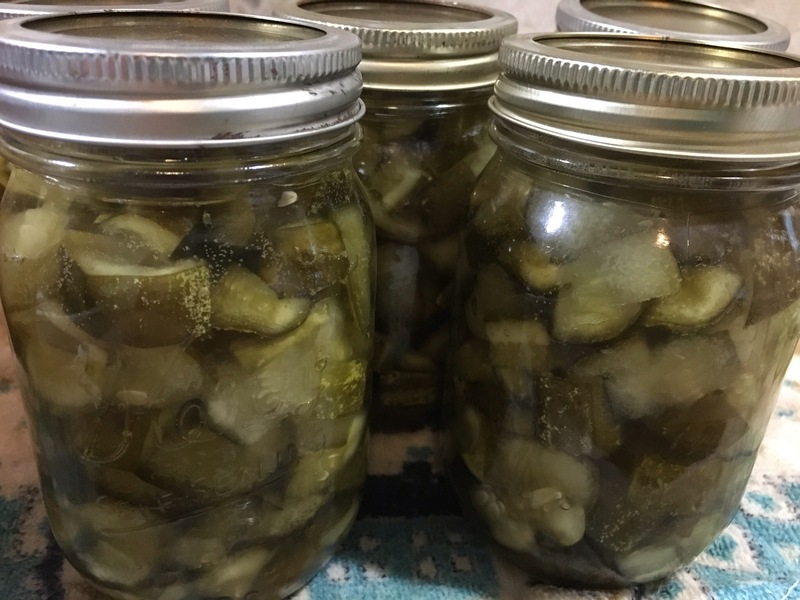 The pickle making is currently at least a part time job for me at the moment. Miss L. is taking a pottery class this week. It was supposed to be at a facility 15 minutes from our house. It got moved to a location 30 minutes from our house. Two hours a day of driving. I am dealing with some life aggravations that include disputing a medical bill. 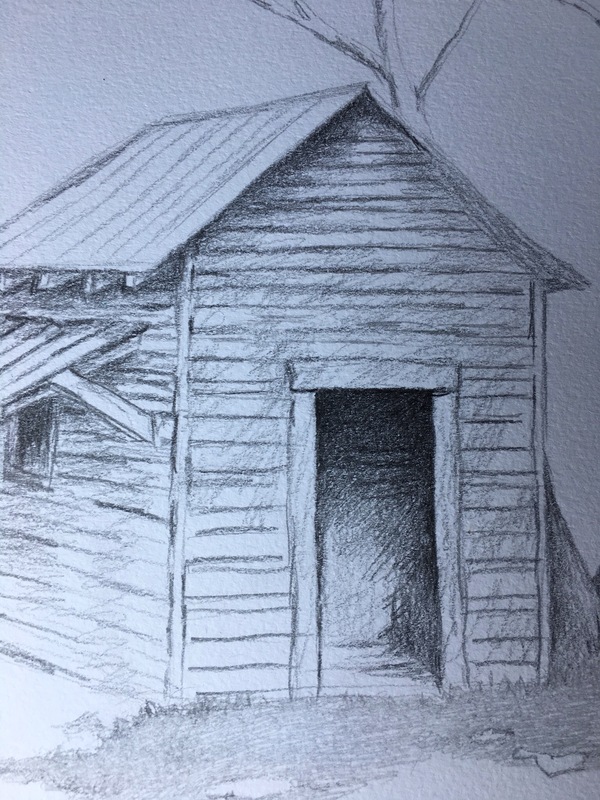 I suspect that alone will take several hours this week with phone calls and letters, plus a couple other time intensive problems to solve. 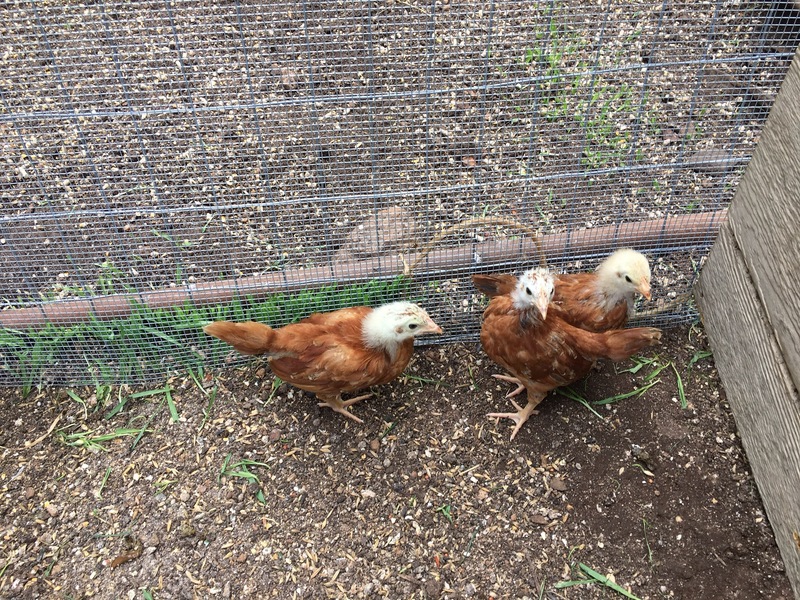 We added 3 chickens to the flock yesterday. We thought they would be teenage pullets. Instead, they are pre-teen pullets and much smaller than our new chicken run set up. They are so small they can get through the run wire. On one side are the grown hens who are not above pecking one of their own kind to death. On the other side is the pasture and the domain of the infamous chicken killing raccoon. And on the third and forth side awaits Sweetie Pie the Cat, who realized the new girls are the perfect snacking size. We have now rigged a containment center within the run, but it’s in the testing stage (and as they grow has the potential for escape) so I have to regularly go out to do a security check. Keeping chickens alive around here is a full time job! The tomato plants are heavy with little green tomatoes and growing faster than I can tied them up. Brace yourself for for a plethora of tomato pics and complaints in the very near future. The yard needs mowing, the herbs need picking and drying and do I really need to mention laundry, cleaning and cooking? I started some artwork two weeks ago and it just sits and taunts me right now. This is life in Crazyville at the moment. I’m just doing it like Nike tells us to do. Hopefully you will hear from me next week, but if you don’t, be assured I am buried under a pile of cucumbers and tomatoes. Go somewhere and have a relaxing vacation for me please. Have a great week!